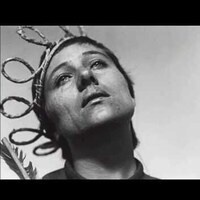 Voices of Light merges Carl Theodor Dreyer’s legendary silent film masterpiece The Passion of Joan of Arc with a live performance of a beautiful new work by composer Richard Einhorn. After viewing the film, Einhorn was inspired to compose this lush and moving oratorio with a libretto drawn primarily from medieval female mystics’ texts. An incredibly moving and popular composition for solo voices, chorus and orchestra, Voices of Light has been hailed as “a triumph” (Los Angeles Times) and “an overwhelming experience” (Chicago Tribune). With over 100 performances to date, Voices of Light has a proven popular appeal and a special ability to deeply touch the hearts of its audiences. This special collaboration between the Department of Music and the Film & Media Studies Program brings together one of the most transcendent films of the silent era, The Passion of Joan of Arc, with a live performance of composer Richard Einhorn’s oratorio Voices of Light. Chronicling the trial of Joan of Arc in the hours leading up to her execution, the film uses expressionistic lighting, interconnected sets, and intimate close-ups to immerse viewers in her subjective experience, while the hauntingly beautiful, lush musical setting and libretto drawn from a variety of ancient texts bring the ecstasy and agony of martyrdom to life. Pre-event lecture by composer Richard Einhorn on December 7th at 2:45 pm in Golden Auditorium. This event is sponsored by the Department of Music Choral Music Program, the Film & Media Studies Program, the Colgate Arts Council, and the Faculty Development Council, with additional support from University Studies, the Department of Religion, and the Medieval & Renaissance Studies program. For more information about this performance and the Department of Music Concert Series, please contact Lorraine Joseph, Concert Manager, at ljoseph@colgate.edu. For more information about the Friday Night Film Series, please contact Angela Kowalski at akowalski@colgate.edu.